Winx Club: The Secret of the Lost Kingdom Movie on DVD was our first introduction to the Winx Club and it was a big hit with my children. My five year old daughter especially enjoyed the adventures of the fairies of Alfea College including Bloom and her fairy friends, Stella, Flora, Tecna, Musa and Aisha. 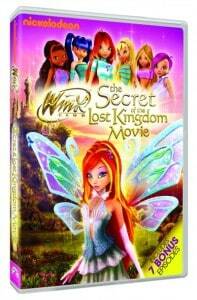 The Secret of the Lost Kingdom is a full length CGI movie and this DVD also includes seven bonus episodes from the popular television series the Winx Club. Both the movie and television episodes transport children to a fun world of fantasy where the imagination soars with fairies, magic, wizards and villains. I appreciate that the content is suitable for my children (ages 5 and 7) and I like that it focuses quite a bit on the power of friendship and helping others. After viewing the movie, it was fun watching my daughter trying to role playing by putting her brothers into the roles of her fairy friends. This two-disc collection features hours of entertainment and is available for purchase starting August 7th 2012 from Nickelodeon and Paramount Home Media Distribution. You are invited to visit the Nickshop.com to shop for all your favorite Winx Club products and this DVD is on sale for only $14.99. My daughter wold love to have the Winx Club Vanity. I like the Fantastic Fairy Fan Book. My daughter woulde njoy the Winx 11.5″ Deluxe Fashion Doll Believix – Tecna. Please Enter Me In Your Winx Club:The Secret of the Lost Kingdom Movie DVD Giveaway. and comment on another Winx Club toy/movie your child would love! And The Winx Club:Magical Fairy Party Nintendo DS Game. Thanks For Having This Giveaway!!!!!!!!!!!!!!!!!!! My kids would love the spongebob its a spongebob christmas. My grandkids would also love the Winx Club Concert Stage with Doll. Winx Club: Magical Fairy Party ds. The Winx Club Vanity looks very nice!